SoftPlanet makes it possible for everyone to get free AVG PC Tuneup download directly from our servers. There is no registration needed for downloading. AVG PC TuneUp 16.13.1.47453 is a very useful and practical application, dedicated to keeping your computer in perfect shape. What it actually does is optimize your OS settings and clean files, which could slow it down. It comes with more than 16 built-in apps, which are designed to assure your great and prompt support. As mentioned above, AVG PC TuneUp 16.13.1.47453 is a software suite, which includes over 16 different tools, each dedicated to performing different actions. You are able to disable and uninstall programs, which obviously slow down your operating system. You can edit, clean and defragment the registry as well. That's not all. AVG PC TuneUp provides you with a tool, whose main purpose is to tune up your hard drive. The PC modes – Economic, Standard, Turbo, Flight modes - are one of the things I adore this utility suite for. Let's take the Economic mode for example. It boosts battery life and reduces energy usage by turning power-sapping devices and programs off. 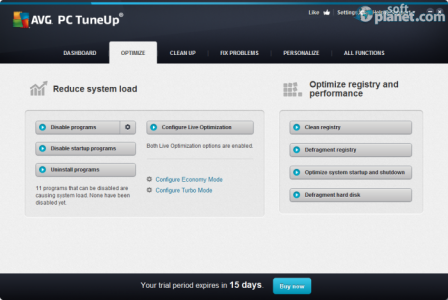 Another awesome feature AVG PC TuneUp has is called Optimization Potential. It measures the level of the optimization potential and shows you details on what actions have been performed. 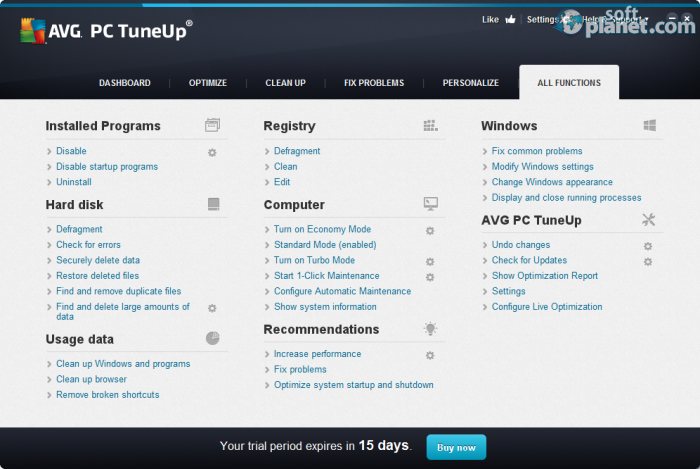 Just like all AVG Technologies products, AVG PC TuneUp comes with a clean and user-friendly interface. The GUI is divided into several tabs, which makes navigation very easy. Each tab includes features from a different category. 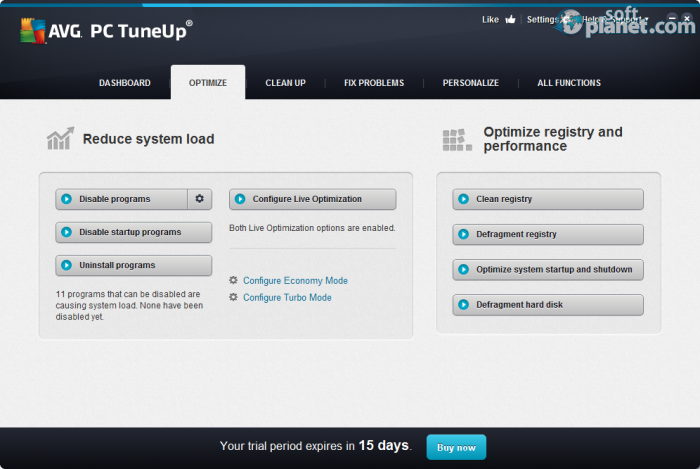 However thanks to the ALL FUNCTIONS tab, you can see all of the available functionalities, which AVG PC TuneUp has. Like its competitors, its interface cannot be resized. However its design is very simple and classy. The first tab named Dashboard contains overall information about your PC and gives you quick access to some available features like Maintenance, PC Performance, PC Health and Rescue Center. Once you have installed the app, it asks you to perform a full OS scan. It looks for registry errors, broken shortcuts, etc. When the verification has been completed, it enables you to fix everything with a single mouse click. Each of the four different PC modes is dedicated to assuring you a quick and convenient way of setting your OS regarding the current situation. I have been amazed by the AVG PC TuneUp performance. It doesn't use many system resources and didn't break down during the tests, which, believe me, were very tough. 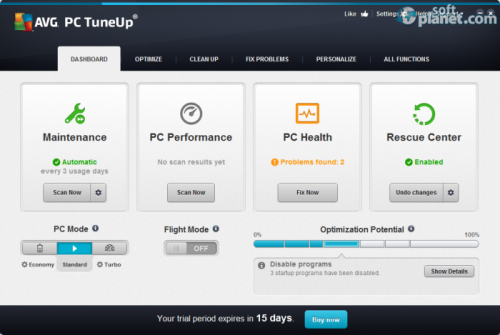 AVG PC TuneUp is an extraordinary software suite, designed to tune up your operating system. Unfortunately, it is paid and comes with a short trial period, just 15 days. Thus I suggest that you purchase it so you can tune up your OS, whenever you want. AVG PC Tuneup is VIRUS-FREE! 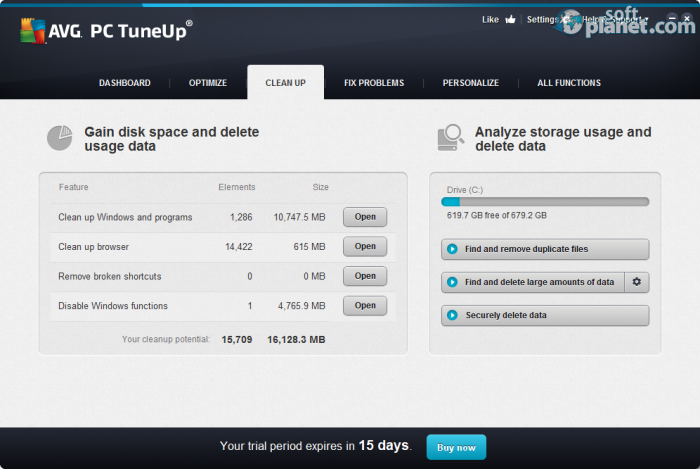 Our security scan shows that AVG PC Tuneup is clean from viruses. 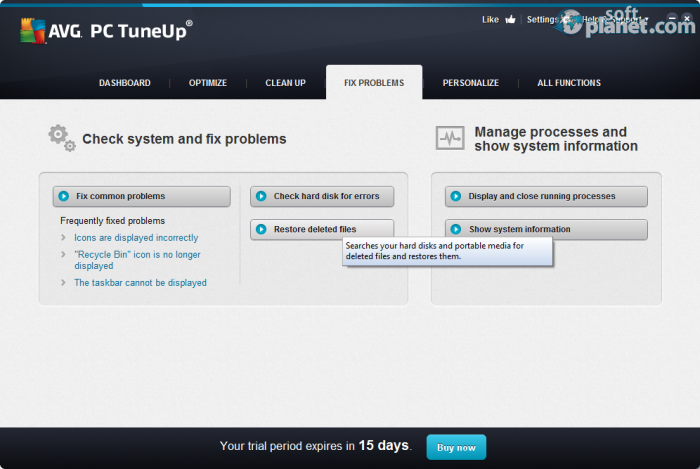 The current version of AVG PC Tuneup has been scanned by our system, which contains 46 different anti-virus algorithms. 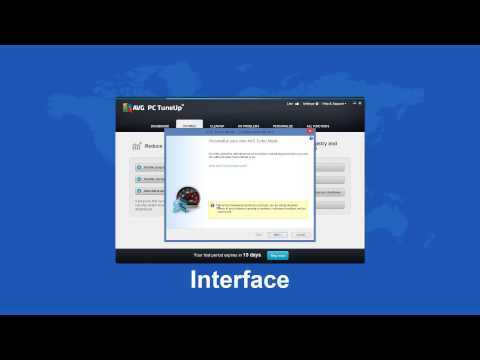 That ensures that AVG PC Tuneup 16.13.1.47453 is 100% safe for your computer.